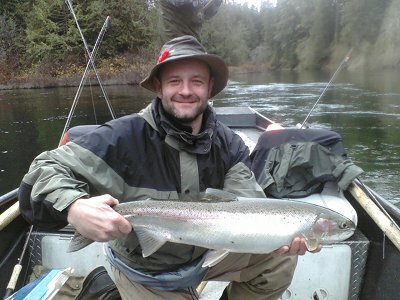 20th November, 2010: FISHING REPORT: Port Alberni Inlet, Barkley Sound, Ucluelet (West Coast), Somas-Stamp River System. It is mid-November and rather than thinking about the past summer of fishing and the many great days all sport anglers had on local bodies of water we are now preparing for the summer of 2011. Pre seasonal 2011 forecasts for local Sockeye and migratory salmon runs migrating to southern watersheds look rather promising. 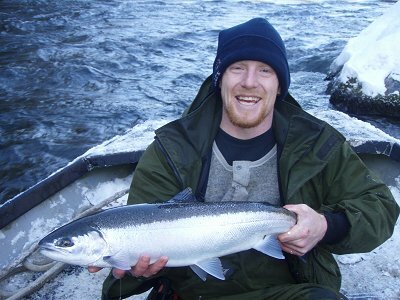 There will be more information about 2011 summer salmon runs in the early part of the New Year. November has been not a month of wind and rain but in truth there have been some great sunny and rather warm days. This is not to say that there have not been a few heavy rains. The Stamp River has had high water and at the moment is at an average level. There have been times that fishing the Stamp for Fall-Summer Steelhead has been difficult because of the water abundance but it looks like with cooler weather on its way the Stamp will stay lower and allow for some great Steelhead fishing for the better part of the last half of November. Salmon returns to the Somass system have not been high in number this fall. November the 5th was the last count for the Somass River Escapement Bulletin. The Somass system is a key stream for Sockeye, Chinook, and Coho. In 2010 the summer Somass River Sockeye returns were well over 1.1 million which was well over the 600,000 projected number. However Chinook at 27,000 and Coho around 22,000 were very low in returns. The Chinook numbers in terms of return still allowed for the necessary 57 million egg count at Robertson Creek Hatchery. Fisheries and Oceans Canada in partnership with Hupacasath First Nations facilitate a counting operation from late May to early November. The fish way is open daily and the salmon are counted by trained observers. The salmon migration is also videotaped and with this observations and counts are better than 95% accurate. Water levels in the Stamp are currently at an average level for mid-November. The Summer-Fall Steelhead fishing for the past few weeks could be described in one word as “mediocre”. There have been some better than average days but most guide boats are averaging 5 to 8 hookups in terms of Steelhead and 5 to 6 trout hookups per day. With water levels decreasing we are expecting some good fishing over the next few weeks. The Chinook wild spawn has thinned out and the Coho spawn is taking place. The best fishing is in the Upper River with boat pressure on weekends being quite high in fishing areas below or above the hatchery. Weekdays in terms of fishing pressure has been quite low. Fishing above the Ash has been very good. The bridge area of Great Central has been good for those sport anglers not operating a drift or jet boat. The Lower River has seen little fishing but expectations are that in the next few weeks there will be some late Fall and Winter Steelhead will begin to show which will move some of the weekend pressure to other areas. With the Coho spawn, anglers are using or mimicking what the Steelhead are feeding on. A bait ban is in effect from “the bucket” so fish egg imitations are a must. Guides are using single egg imitations. Jensen eggs are the most popular. Also gorkies, and spin-n-glows are doing well. Most individuals are float fishing and only a few are bouncing off the river bottom which is currently because of river conditions an unsuccessful type of fishing. When the fishing in the Lower River picks up bait can and should be used (below the bucket) as well as gooey-bobs, pink worms, and spin-n-glows in bc orange and regular orange colors. 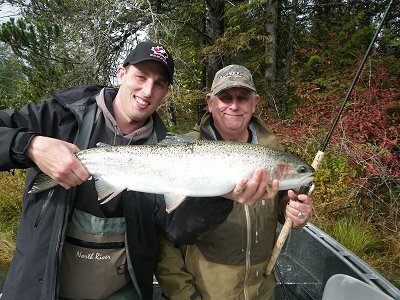 We are expecting the Stamp River which is British Columbia’s premiere fishing destination river to have some terrific Steelhead fishing right through March of 2011. Sport prawn fishing reopened on the 15th of November in the Alberni Inlet. The opening will be for 15 days. Please check all DFO regulations and openings. Most individuals at this time of year will prawn close to China Creek, the narrows and Cous Creek. Currently salmon fishing is Nil but often Winter Chinook will travel up as far as China Creek if there is bait in the area. 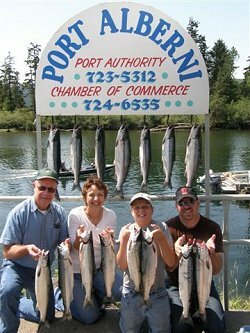 We are expecting a healthy return of Sockeye salmon in June, July and early August of 2011. Of course all fisher people are hoping that returns next summer will be similar to this past year which was well over 1.1 million. Sockeye usually begin schooling in big numbers by mid June as the water in the Somass River begins to warm up. Those individuals who have summer plans to come to Port Alberni and are planning on using a guide should arrange their trip fairly soon as boats and guides may very well be sparse. 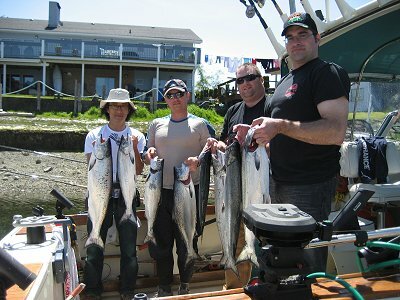 Ucluelet has already been experiencing some good Feeder Chinook fishing. The Inner and Outer South Bank have allowed sport fishermen to have success on salmon up to 17 and 18 pounds. Earlier the T-Rex hootchie was good but recently those fishing offshore, on good days, and those fishing close to the Ucluelet Harbor at the “red can” Mara Rock, and The Lighthouse Bank have been using white hootchies and also a green needlefish hootchie. A four inch cop car and a four inch nasty boy coyote spoon have also been good lures all fished behind a green or red hotspot flasher. During the winter Ucluelet offers some of the west coasts best prawn and crab fishing. The Bottom fishing is also very good. We have a great Seafood Safari in the spring. One must remember that the Pacific Ocean during the winter can have some magnificent storms but also there are superb days for fishing as the ocean can be completely flat. Winter fishing is often very close to the harbour. Safety of course is always a priority. 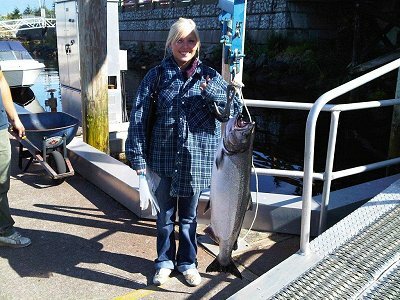 Ucluelet will once again be a fisherman’s paradise in the summer of 2011 as preseason predictions are showing a very healthy return of four year old migratory salmon swimming the coast and destined to watersheds to the south. These fish swim as early, mid, and late summer fish. If things remain true to past years the best fishing is from the second week of June through to mid August.